anyone point me in the direction of this article? it;s got a script that will hopefully fix a startup error of r6 mac client. We no longer use article numbers. Can you be more specific about what you are trying to find? i've got the same issue as this thread and they mention a script that can fix the problem. 4) Reinstall the Retrospect Client. Retrospect should prompt you to enter a new password during the install process. 5) Go to the backup server and re-add the Retrospect Client. 4) Go to the backup server and re-add the Retrospect Client. that's fixed it. thanks so much robin. great support as always. I'm not sure where to post this, and I'm sure I'm not going to get an answer back tonight, but it's worth a try. I stopped using Retrospect some time back, but now I need to open some old backup files. 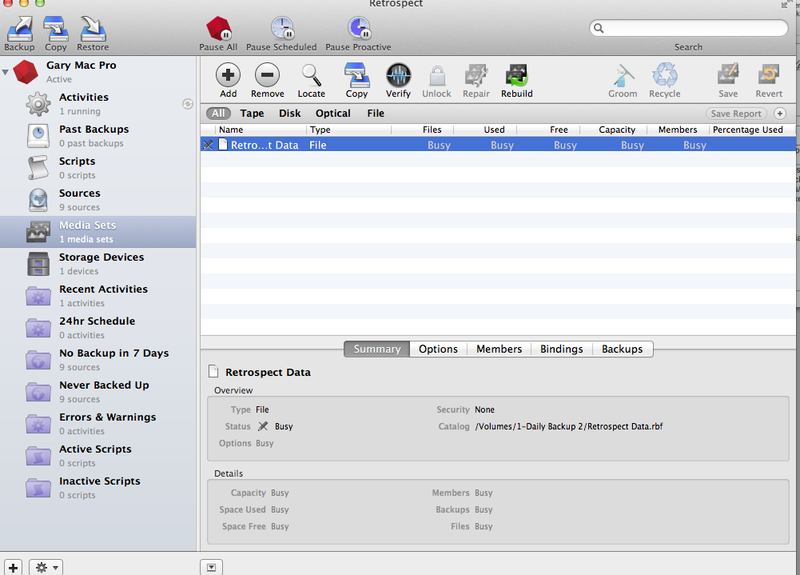 I downloaded a new version of RS, and asked it to rebuild the old "Restrospect Data" file (that, on my Mac Pro running 10.8.5, looks like an exe file from a PC), and it immediately created two new files on the backup disk: "Retrospect Data.rbf" and "Retrospect Data.rbf.rfc"
The "rbf.rfc" file is 4KB. The Retrospect window, showing the file I wanted to rebuild, shows the filename, Type: File, and then "Busy" under the Files, Used, Free, Capacity, and Members columns. I don't know whether I can try to open and uncompress the files on another disk, or whether the "Busy" means it's still working. Nor is it clear which file has the rebuilt archive. If there's anyone here who can steer me to some help on this, it would be much appreciated. The Activities link in the sidebar has an icon that some activity (probably your catalog rebuild) is still running. Click on "Activities" to view the activity window and click on the "Running" button to see the details.